An enthusiastic group of young adult Catholics who are IUPUI students and St. John the Evangelist parishioners attended the press conference announcing the appointment of Father Christopher J. Coyne as the auxiliary bishop of the archdiocese. They also displayed a large sign that read “IUPUI [heart]s our shepherd” to surprise Archbishop Daniel M. Buechlein. 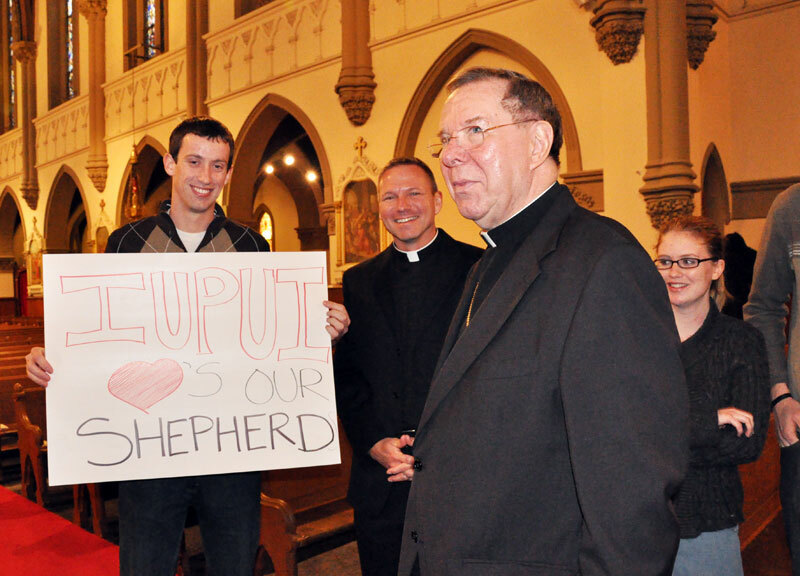 “We need to add an ‘S’ to our sign,” said Breanna Holder, an IUPUI sophomore and St. John parishioner from Odon, Ind., in the Evansville Diocese, who is majoring in journalism, so the poster can also refer to Bishop-designate Coyne. Holder said she is glad that Bishop-designate Coyne writes a blog for St. Margaret Mary Parish in Westwood, Mass., www.blog.saintmmparish.org, and hosts Catholic videos posted online. IUPUI freshman Patrick Burton also attended the press conference. He completed his primary education at St. Lawrence School in Indianapolis, and is majoring in computer science and applied math with a minor in Spanish. St. Paul parishioner Michael Conner of Tell City, a senior at IUPUI, serves as the president of the Catholic Student Organization there and is discerning a possible call to the priesthood. He held the sign during and after the press conference. Bishop-designate Coyne and to work with him a little bit. Father Rick Nagel, the director of the archdiocesan Office of Young Adult and College Campus Ministry as well as the Catholic chaplain at Indiana University-Purdue University Indianapolis (IUPUI), was also appointed the new administrator of St. John the Evangelist Parish by Archbishop Buechlein, which is effective on Feb. 15 because Father Stephen Giannini, the current pastor, will accept additional administrative duties for the archdiocese. Bishop-designate Coyne will reside at the St. John Parish rectory with Father Nagel and Father William Stumpf. “I’m also excited to have that kind of a mentor close to me, someone with his experience, love for the Lord and his Church, and desire to be holy,” Father Nagel said. “I’m looking forward to hanging out with him and learning from him, and continuing to serve our shepherd, Archbishop Daniel, who has been such a great spiritual father for me. I’m very happy and am looking forward to becoming the administrator here. “The archbishop has made young adult and college campus ministry one of his top three priorities for the remainder of his service to the archdiocese,” he said. “Our young people are a joy to be around, and they are responding so beautifully to the ministry. We’ll hopefully be able to introduce Father Coyne to them soon, and for them to be able to share their enthusiasm.